Our CEO at TiE Connect 2014! Team Clear Car Rental is very happy to announce that, today, our founder & CEO Mr. Sachin Kate will be addressing the evolving entrepreneurs of North Karnataka at ‘Tie Connect 2014’ in Hubli, Karnataka. Mr. Sachin Kate is one of the keynote speakers. 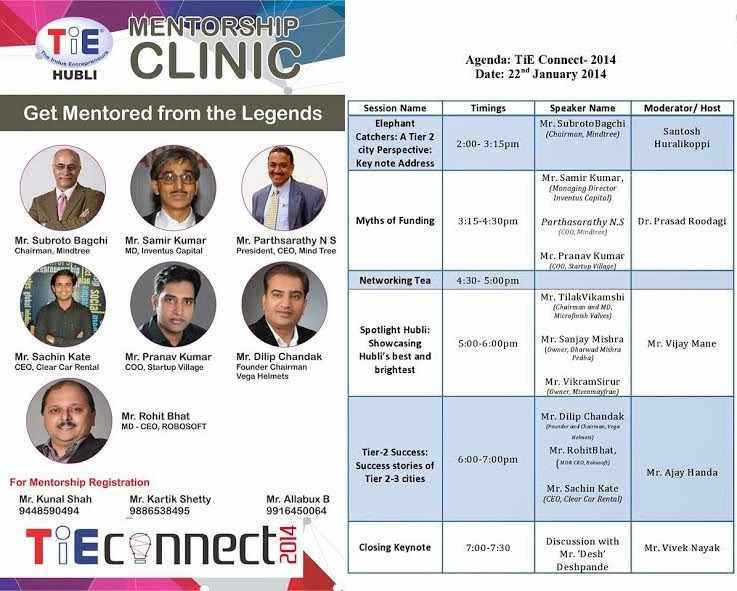 ‘Tie Connect 2014’ is a workshop organised by The Hubli Chapter of The Indus Entrepreneurs (TiE) on 22nd Jan 2014. The Indus Entrepreneurs (TiE) is a training institution to encourage the spirit of entrepreneurship through networking, mentoring and lecturing. The institution is committed to fostering entrepreneurship. Training sessions are held at Deshpande Centre of Social Entrepreneurship (DCSE) in Hubli. The intention is to bring noted venture capitalists and successful entrepreneurs from Tier-2 cities on a common platform to share their success stories and thereby, to guide young entrepreneurs. Our founder and CEO is one of the invitees to speak upon his success story of scaling a business being situated in a Tier 2 city. Hailing from a small city in Maharashtra, Sachin Kate has become a hero for the budding entrepreneurs in Aurangabad, Maharashtra. There is Lao Tzu saying, “A journey of a thousand miles must begin with a single step.” As to prove this saying, Sachin Kate has climbed the ladder of success step by step. He has worked as newspaper by, has been an office attendant, and then became a computer instructor. He picked up the travel and hospitality line of business slowly, by indulging himself in website designing and developing. His blog post titled “Aurangabad Calling” inspired many unemployed youngsters of Aurangabad. Clear Car Rental Pvt Ltd is his dream child. He has been able to scale the company to 250+ cities without raising a single penny of institutional funding. CCR provides local and outstation travel packages for round trip, one way drop and multi city travels. He has set an example for the younger generation who think that the key to success in business field lies in holding a M.B.A degree from some or the other deemed institution. Our CEO is a self educated man in the field of business. We congratulate Mr.Sachin Kate and wish a great success to TiE Connect 2014!